I found this concert curiously unsatisfying. Not that the group wasn't in good form...just that the mix didn't seem right. 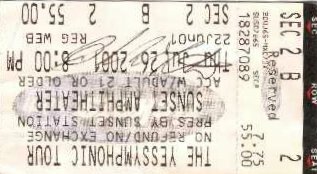 Last year when Yes played the House of Blues as a six-piece band, it was one of the best Yes shows I've ever seen. I was kind of looking forward to this show, as among other things, I know several of the players in the orchestra (rather than touring with an orchestra, Yes is contracting locally at each venue). It was nice to see them up there. But the mix did not seem to take. The orchestra parts seemed sort of shoe-horned in and awkward. The result was it felt like the group was being held back, and didn't play with the grace and ease I am used to seeing. There is also the matter of song selection. This, of course, is just a matter of individual taste, and I am sure there are plenty of folks--maybe the majority--who disagree with me. But I thought it was just a little too heavy with the epic pieces. Plus, it looks like now that Billy Sherwood is gone, Yes has jetisoned all references to the Trever Rabin period...which, after all, was more than a decade (and four studio albums) of Yes history. I'm not one of those who prefers Rabin over Howe or the other way around. It's all good stuff, and it would be nice to mix it up a little, instead of sticking to nothing but pre-1980 compostions along with a couple of as-yet-unreleased songs from the new album. The current keyboard player--I forget his name--seemed quite competant. He didn't get many chances to stretch out, but everything I head seemed right on the money. 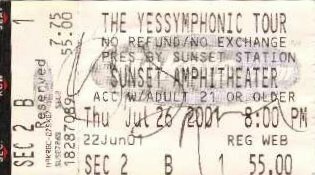 This was my 7th Yes concert...and while I certainly wouldn't say it was bad, it just wasn't quite as exciting as the others I've seen. Most of the audience seemed to be having a great time, so I think my opinion is in the minority. Just offering a different point of view. As always, next time Yes comes to town, I will be there.